'Lcmutee is a Sangheili Warrior. He is an accomplished Type-58 Wraith pilot, as evidenced by his title, Tankmaster. He is featured as a mini-boss in the Spartan-IVs' Warzone training simulations. 'Lcmutee is a boss to appear on multiple maps in Warzone Firefight, and drives a Temple Raith. 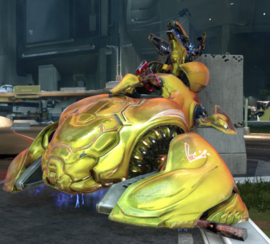 Tankmaster 'Lcmutee's Wraith is painted gold and has increased accuracy and health from a usual Wraith, and other Wraith bosses, such as a Wraith Officer. His Wraith cannot be boarded or hijacked. However, if it is disabled multiple times with an EMP, 'Lcmutee will exit the Wraith to fight with a storm rifle and grenades. His empty Wraith cannot be driven. Killing one will remove one of the bosses needed to complete the round leaving 2 more named Tankmasters to kill, and earn the player a Legendary Takedown medal. He is called in along side Tankmasters 'Reiss and 'Ahtulai, as part of an Armored Lance. All 3 tanks, and Elites themselves, are identical.